As a Partner at Laquer Urban Clifford & Hodge, Mana F. Bolourchi’s practice encompasses all forms of business and real estate transactions and litigation. 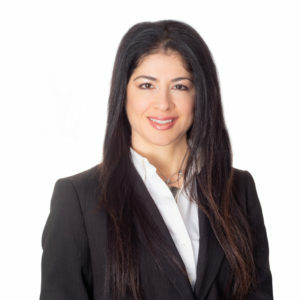 Her work includes negotiating and drafting commercial and office leases on behalf of clients, as well as representing them in disputes such as eviction actions. In addition, she advises clients on general business and real estate issues related to leasing, residential sales, bankruptcy and finders’ fee agreements. Her clients include multi-employer pension funds, private businesses and individuals. Prior to joining the firm, Ms. Bolourchi practiced general civil litigation and business law. She also has extensive business experience of the Law. While in law school Ms. Bolourchi was the Production Editor for the Hastings Communications and Entertainment Law Journal. Ms. Bolourchi received her Juris Doctor degree from Pepperdine University School of Law, and concurrently obtained her Master of Business Administration degree with an emphasis in Finance from Pepperdine’s Graziadio School of Business and Management. She earned her undergraduate degree from the University of California at Berkeley. Ms. Bolourchi is a member of the State Bar of California, the Los Angeles Bar Association and the Manhattan Beach Chamber of Commerce. In addition, she is a founding member of the Center for Entrepreneurship and Technology Law (now the Geoffrey H. Palmer Center for Entrepreneurship and the Law) at Pepperdine University. Ms. Bolourchi is also the Vice Chair of the Los Angeles chapter of the business school’s alumni network. She is licensed to practice law in California in all state courts and the Central District of the United States District Court.